We are also an inclusive school, where every pupil is equally important to us. The balance of learning support, physical development and pastoral care is tailored to the needs of the individual child. Sport, Music, Art and Drama are all renowned strengths of the school, and a glance at our term calendar reveals the wealth of activities, trips and events which provide so many opportunities for our students to shine. We lead each of them, not only to achieve their highest academic potential but also to enjoy learning itself: that is what makes an alert, ambitious and resilient person who can thrive and prosper in tomorrow’s world. Everyone has the chance to pursue passions, to participate, to be part of a group: to develop confident relationships but to be unique. The relaxed, warm and unpretentious atmosphere of our diverse, vibrant community will strike you immediately. We stress courtesy, concern and respect for all the members of our school. To see why children come from such a wide area, visit us and meet our staff and talk to our students – They are our best advertisement. 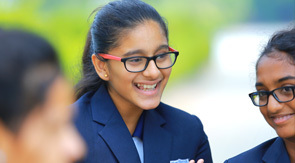 "The primary reason for joining the school is the quality of education, opportunities, wide range of activities for students and parents, housing inside the school community, environment, surrounding of the school and facilities the school provides and also being one of the best IGCSE Schools in India."